If there’s one thing summer is known for, it’s fresh fruits and veggies. Is there anything better than a fresh picked apple or tomato or red potatoes dug up from the garden? Or if you don’t have your own garden, do you hit the local farmer’s markets just to have that sweet taste of something so fresh, that buying them in the store just isn’t really worth it? I guess that’s why when Naomi showed me her page, I could soooo totally relate. Being able to pick off a fresh strawberry or gather raspberries to put on some ice cream was a regular summertime treat growing up for me. One tends to get a little spoiled when one has fresh fruits and veggies a short walk out the back door. 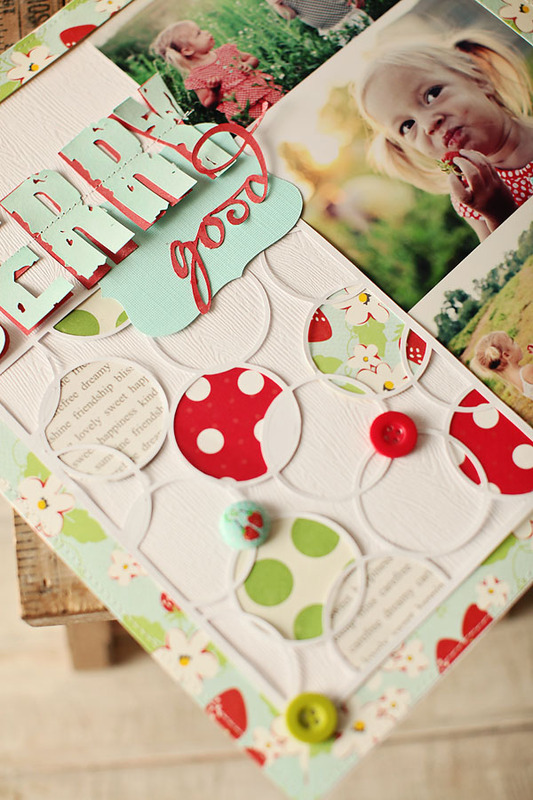 Love the colors Miss Naomi used on this page…especially how they have been intertwined into the circles! Great summertime page! I LOVE this! Bravo! Love the circles and the distressed letters and the sewing through it. Excellent! Love the circles! Great layout for summer yum!